HIV/AIDS, STIs sensitization, health talk shows in the community, provide support and education to vulnerable people, and constructing shelters to the poor, widows and orphanage.The project provides free vocational education to vulnerable youth, unemployed youth, and school dropouts due to lack of school fees or unwanted pregnancies. Then at every end of the course, every graduate gets free start up kit/ tool box, to enable him/ her, able to start up own work shop. 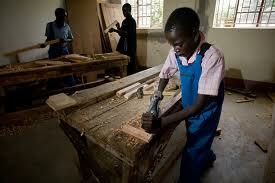 They are taught carpentry, tailoring, knitting, hair dressing and electrical installation. Mission: Empower the marginalized disabled, vulnerable youth/ school dropouts and orphans, through vocational skill acquisition and promoting better standards of living. Vision:To reduce unemployment and over dependency among the less marginalized groups of people. Create community awareness on sexually transmitted infections amongst risky groups. Create a conducive educational atmosphere by fully equipping the vocational project with all the necessary educational tools/ machines. To help vulnerable/ poor/ orphans attain education by way of getting them sponsorship and scholastic material support. To develop, promote and sensitize children nutrition. Construct shelters to the poor, elderly, widows and orphanage homes. Provide start-up kits to every our project graduating student.